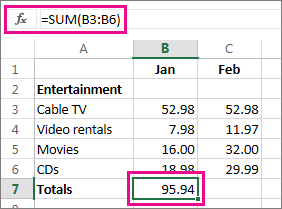 If you need to sum a column or row of numbers, let Excel do the math for you. Select a cell next to the numbers you want to sum, click AutoSum on the Home tab, press Enter, and you’re done. 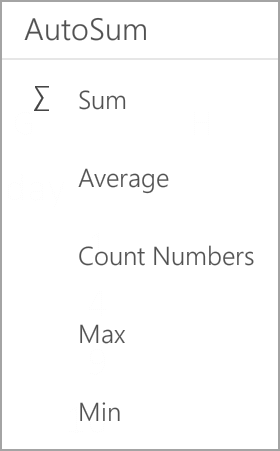 When you click AutoSum, Excel automatically enters a formula (that uses the SUM function) to sum the numbers. Here’s an example. 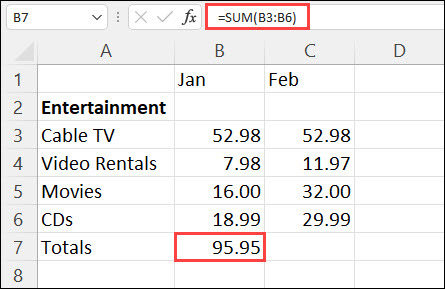 To add the January numbers in this Entertainment budget, select cell B7, the cell immediately below the column of numbers. Then click AutoSum. A formula appears in cell B7, and Excel highlights the cells you’re totaling. Press Enter to display the result (95.94) in cell B7. 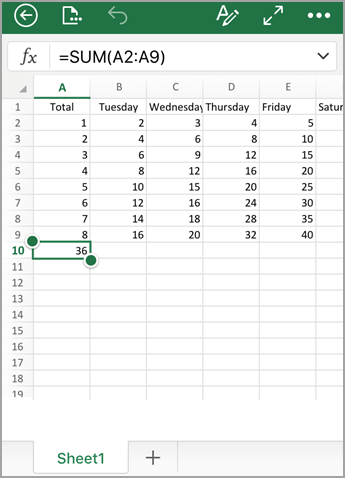 You can also see the formula in the formula bar at the top of the Excel window. Once you create a formula, you can copy it to other cells instead of typing it over and over. For example, if you copy the formula in cell B7 to cell C7, the formula in C7 automatically adjusts to the new location, and calculates the numbers in C3:C6. 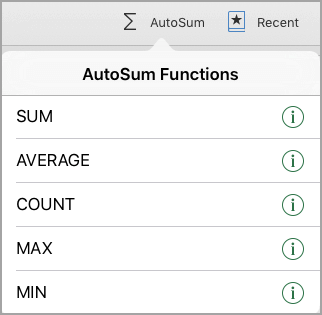 You can also use AutoSum on more than one cell at a time. For example, you could highlight both cell B7 and C7, click AutoSum, and total both columns at the same time. You can also sum numbers by creating a simple formula. 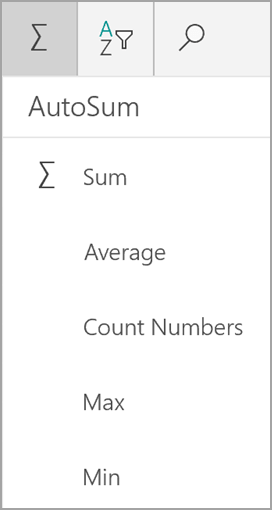 If you need to sum a column or row of numbers, let Excel Online do the math for you. 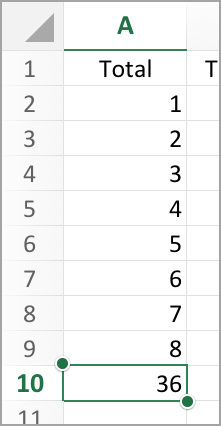 Select a cell next to the numbers you want to sum, click AutoSum on theHometab, press Enter, and you’re done. 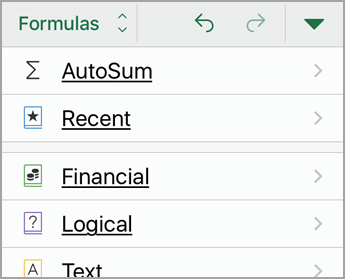 When you click AutoSum, Excel Online automatically enters a formula (that uses the SUM function) to sum the numbers. Here’s an example. 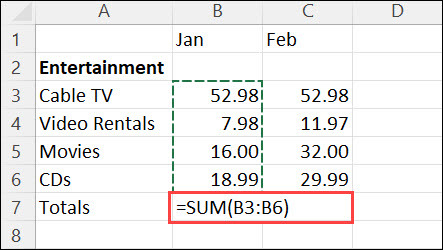 To add the January numbers in this Entertainment budget, select cell B7, the cell immediately below the column of numbers. Then click AutoSum. A formula appears in cell B7. Press Enter to display the result (95.94) in cell B7. You can see the formula in the formula bar. 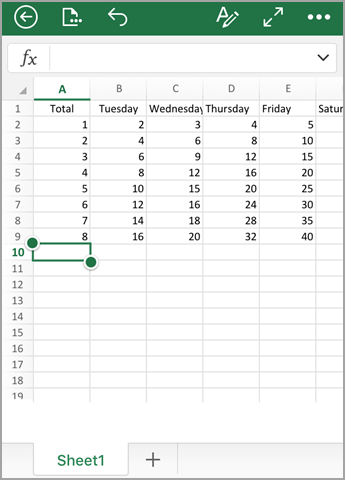 In a worksheet, tap the first empty cell after a range of cells that has numbers, or tap and drag to select the range of cells you want to calculate. To sum a column of numbers, tap to select the cell immediately below the last number in the column. 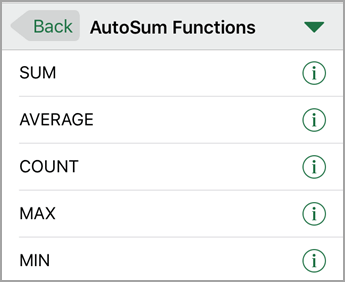 On the Formulas tab, tap AutoSum . Tap Sum and then tap return. Tap to select the cell immediately below the last number in the column. Tap the ribbon button .